Torquay United have appointed Colin Lee as the club's new director of football on a three-year contract. Former boss Lubos Kubik left Plainmoor at the start of the week and Lee will manage the team until he finds a suitable replacement to take over. Lee, 50, who managed the Gulls for a four-month spell in 2001, returned to the club in January to assist Kubik. Lee told the club website: "I believe I can have a greater positive long term effect on the club within this role." The former Watford, Wolves, Walsall and Millwall manager added: "Over the next three years I intend to implement a new blue print for the football department of Torquay United to put us on a par with comparable sized clubs higher up the Football League ladder." Kubik parted company with United after a 15-match, 10-week spell as first-team manager which has left the Gulls five points adrift at the foot of the Football League. 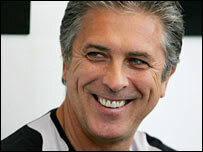 The ex-Czech Republic defender replaced Ian Atkins in November, but won only one of his 12 league games in charge.